A Hyderabadi vegetable dum biryani is a royal dish that is aromatic and delicious. 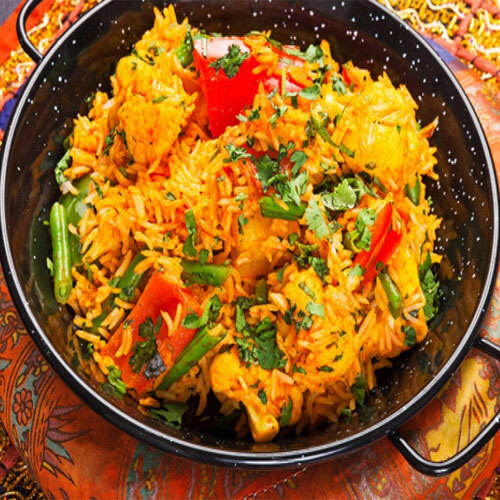 Vegetable dum biryani is one of the favorite among the vegetarians. 1/4 cup fresh curds (dahi), 1/4 cup finely chopped coriander (dhania), a few drops of edible saffron colour, 2 tbsp ghee. Combine 41/2 cups of water, bayleaf, cinnamon, clove, cardamom, rice and salt in a deep non-stick pan, cover with a lid and cook on a medium flame for 10 to 12 minutes or till the rice is cooked. Strain the rice using a strainer and keep aside. Heat the oil in a deep non-stick pan and add the cumin seeds. When the seeds crackle, add the onions and sautÃ© on a medium flame for 1 to 2 minutes or till the onions turn translucent. Add the ginger-green chilli paste, turmeric powder, coriander powder, chilli powder and garam masala and sautÃ© on a medium flame for a few seconds. Add the tomatoes and 2 tbsp of water, mix well and cook on a medium flame for 4 to 5 minutes. Add the mixed vegetables, paneer, salt and milk and cook on a medium flame for another 2 to 3 minutes, while stirring occasionally. Add the sugar, mix well and cook on a medium flame for 1 more minute. Combine the curds, coriander and saffron color in a bowl and mix well. Add the prepared rice mixture and mix well. Transfer 1/2 of the rice mixture in a handi and spread it evenly with the back of a spoon. Add all the prepared vegetable gravy on it and spread it evenly. Top it with the remaining 1/2 of the rice mixture and spread it evenly. Pour the ghee evenly over it and cover it with a lid. Place the handi on a non-stick tava (griddle) and cook on a slow flame for 25 to 30 minutes. Serve immediately.